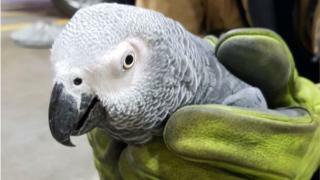 A parrot that attempted to take off from the main runway at Dublin Airport has been reunited with its owner. The African grey female named Hugo was spotted taxiing for flight by a firefighter who was carrying out a routine safety inspection on Sunday. Eagle-eyed Craig Wade said when he saw the bird, it was "obvious that she was a pet". The breed is among the most intelligent animals to be kept as a pet and can live for up to 60 years. "A live runway wasn't a safe place for her so after some difficulty we eventually coaxed her into a makeshift carrier made from a cardboard box," added Mr Wade. The pretty polly was then taken to the airport's fire station where she was cared for by an expert. Dublin Airport tweeted that it was looking for her owner. It received calls from four people who claimed to own Hugo, each of whom was unable to provide the unique identification number engraved on a metal ring attached to the bird's ankle. Who's a clever girl then? But the mystery was soon resolved thanks to a little help from a German supermarket chain. Lidl Ireland replied to Dublin Airport on Twitter, saying: "Guys this is going to sound unbelievable but there's a 'Missing Parrot' poster in one of our stores. "So we called the number to check and it's his parrot!" it added. Lubomir Michna, who lives in Finglas in Dublin but is originally from Slovakia, was the mystery man behind the supermarket poster. He said he could prove that the African grey - a breed best known for its ability to copy words - was his and he had taught it some Slovak sayings. Mr Michna sent an audio recording, which was played Hugo and "she instantly reacted", said Dan Donoher, who looked after the pet before the reunion. Hugo had escaped through a door which had been mistakenly left open in Mr Michna's house on Saturday. Mr Donoher said there was "no doubt in my mind that Lubomir was her rightful owner". "As soon as the carrier opened, Hugo jumped onto Lubomir's arm and cuddled into his neck," he added. "You could see they have a really close bond, it was lovely."